A comprehensive playbook for applied design thinking in business and management, complete with concepts and toolkits As many companies have lost confidence in the traditional ways of running a business, design thinking has entered the mix. 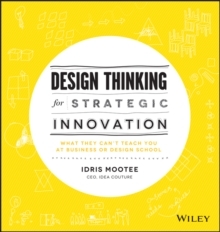 Design Thinking for Strategic Innovation presents a framework for design thinking that is relevant to business management, marketing, and design strategies and also provides a toolkit to apply concepts for immediate use in everyday work. It explains how design thinking can bring about creative solutions to solve complex business problems. Organized into five sections, this book provides an introduction to the values and applications of design thinking, explains design thinking approaches for eight key challenges that most businesses face, and offers an application framework for these business challenges through exercises, activities, and resources. * An essential guide for any business seeking to use design thinking as a problem-solving tool as well as a business method to transform companies and cultures * The framework is based on work developed by the author for an executive program in Design Thinking taught in Harvard Graduate School of Design * Author Idris Mootee is a management guru and a leading expert on applied design thinking Revolutionize your approach to solving your business's greatest challenges through the power of Design Thinking for Strategic Innovation.